Edgar Allan Poe was the Stephen King of his day. The American author specialized in the morbid and the macabre in his short stories and poems, much to the fascination of his fans. Born in Boston in 1809, Poe is more closely associated with the city of Baltimore, where he spent the bulk of his adult life. Heck, the city of Baltimore even named their NFL team after Poe’s most famous work, "The Raven." The life and death of Edgar Allan Poe was almost as strange and puzzling as the characters in his stories, and he certainly broke a few societal norms and literary standards. It has been well-publicized that Edgar Allan Poe was an alcoholic. He drank heavily from his college days – he only attended college for one semester – throughout his adult life. It is likely that alcohol played a part in his early death at the age of 40. To optimize the numbing effect of the alcohol, Poe would mix absinthe, with its high alcohol content, with brandy and other drinks. Poe attempted to get sober several times in his life but always returned to the bottle. Poe also used opium. Opium was commonly used for medical purposes in the early half of the 1800s, so it is no surprise that he partook. Because several of the characters in his stories were opium addicts, many critics assume that Poe was, too. Today, we do not know the extent of his opium use. It is just as likely that he wasn’t an opium addict as it is that he was. When Edgar Allan Poe was 27, he married his first cousin, Virginia Clemm. She was not only his blood relative, but she was just a child. She was only 13 at the time of her marriage. Virginia Clemm and Poe never had children together and some experts claim that they lived like “brother and sister” rather than a married couple. Clemm battled tuberculosis for the last five years of her life and died at the age of 24. Poe was devastated by her death. The event fueled his drinking problem and influenced his later works. Several of Poe’s literary works, such as “Annabel Lee,” “Ligeia” and “The Raven,” include beautiful young women who die tragically young. 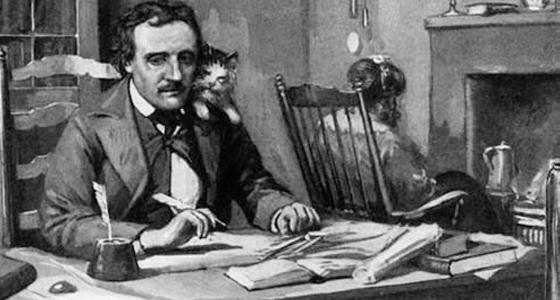 As a literary critic, Edgar Allan Poe penned reviews of literary works that were printed in several prominent newspapers. Many consider him to be the first author to specialize in snark, a mixture of mocking irreverence and sarcasm, which was a hallmark of his reviews. Poe’s snarky style didn’t sit well with his rivals. He once wrote an unfavorable review of a piece by Rufus Wilmot Griswold. Griswold was not happy with Poe’s comments and began a smear campaign against him. 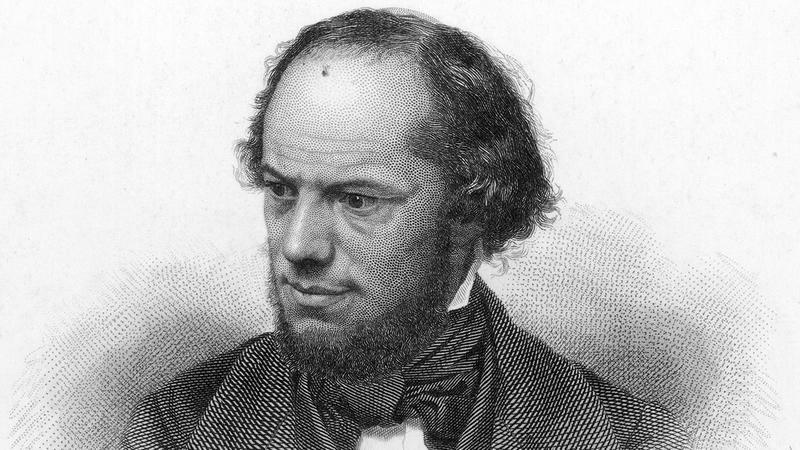 Griswold attempted to out Poe’s alcohol and drug use, as well as his depression and mental health issues. He continued his campaign after Poe’s death, writing an obituary for Poe that can only be described today as fake news. Edgar Allan Poe met a 34-year old married poet named Frances Sargant Osgood in 1845. Although the two openly flirted, Poe’s young wife encouraged their relationship. She even invited Osgood to visit them on several occasions. Poe had promised Osgood that he would “give up the use of stimulants” for her, something Virginia Clemm also supported. 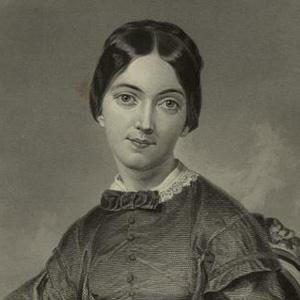 Another poet, Elizabeth F. Ellet, began crushing on Poe and was more jealous of Poe’s relationship with Osgood than she was of Poe’s marriage to Clemm. When visiting the Poe house, Ellet snooped around and discovered letters that Osgood had written to Poe that, she believed, contained salacious material. Ellet attempted to use this find to push Osgood out of the way, but Poe made it clear he was not interested in Ellet. 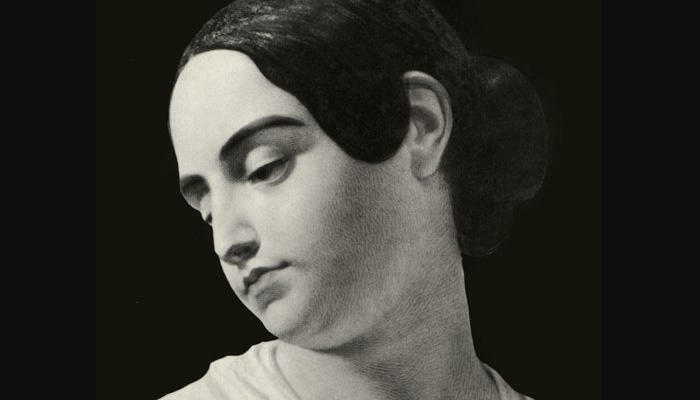 Of her affection, Poe wrote that he “could do nothing but repel it with scorn.” Osgood eventually broke off the friendship and returned to her husband and Ellet moved on, but Virginia Clemm was shaken by the scandal and even commented on her deathbed that she thought Ellet had poisoned her. 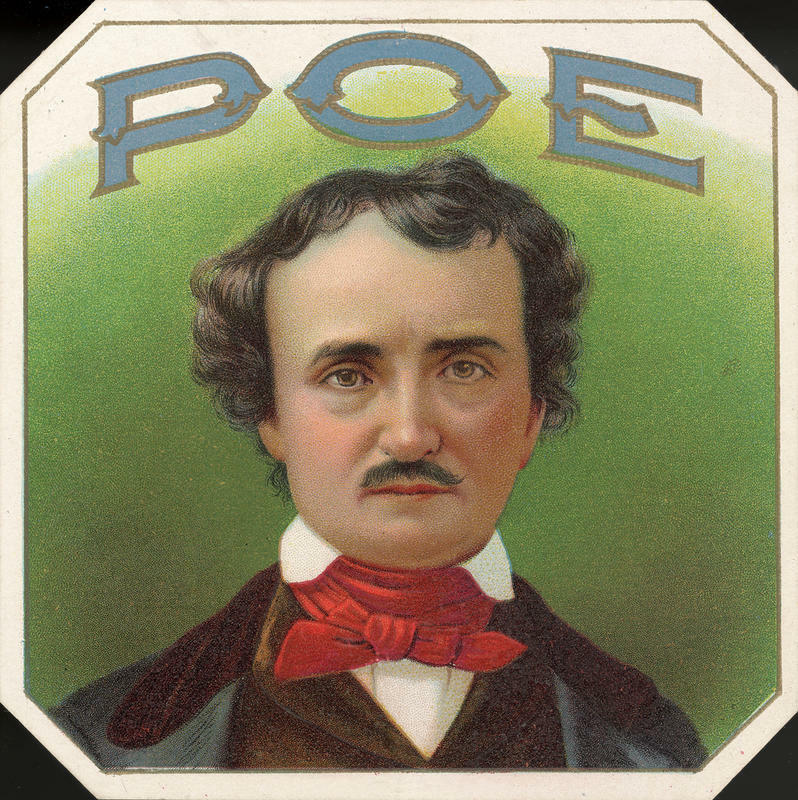 Poe’s 1845 poem, “The Raven” was wildly popular. 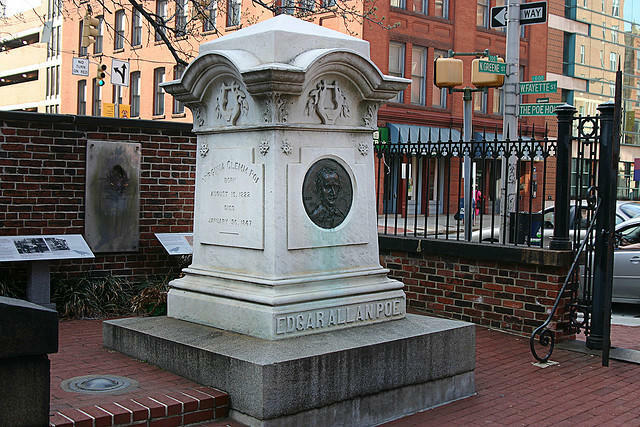 So much so that children would follow behind Poe as he walked along the streets of Baltimore. 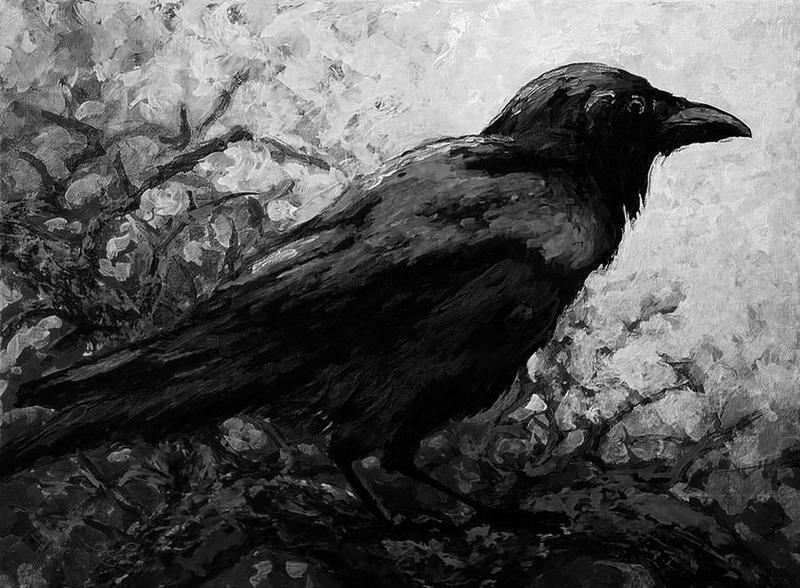 They would flap their arms and caw like a raven. To their delight, Poe would suddenly spin around and shout “Nevermore!” at them. In 1849, just two years after the death of his young wife, Virginia Clemm, Edgar Allen Poe, age 40, disappeared for five days in Baltimore. When he was found, he was battered and delirious and talking incoherently. He was rushed to the hospital but died the next day, on October 3, 1849. The death certificate vaguely listed the cause of death as “congestion of the brain”. Experts have proposed many theories to explain Poe’s strange death and the circumstances surrounding it. Among the theories are murder, a suicide attempt, a bad drug trip, rabies, carbon monoxide poisoning, epilepsy and severe alcohol poisoning. Poe was not a drug addict. Opium was legal and used in many common medications of the day. Poe also drank very little as a small amount could cause him to be very intoxicated.Poe died on October 7,1849, not October 3. Please get your facts straight !! !